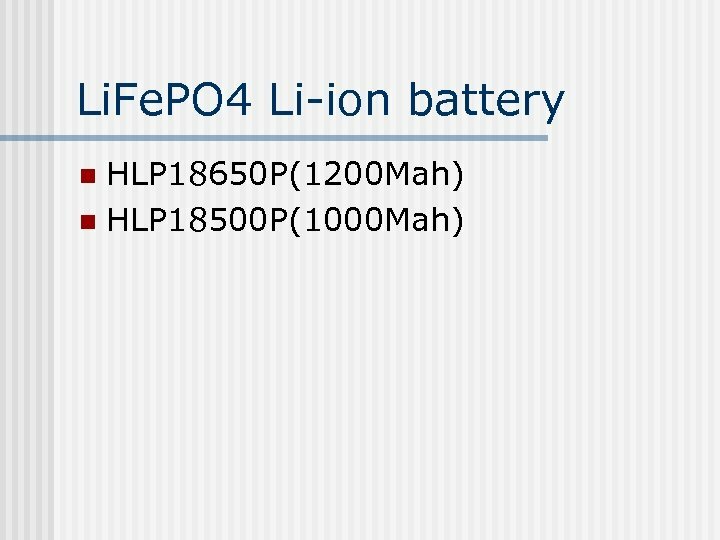 Characteristic of Li. Fe. PO 4 n n n Li. Fe. 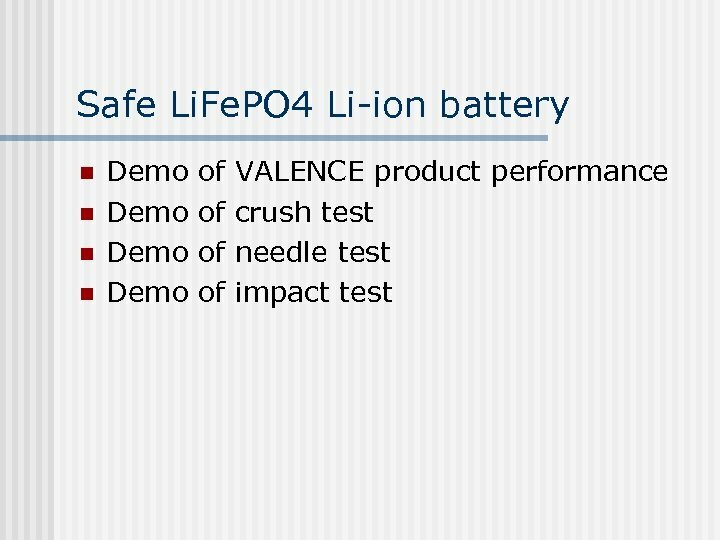 PO 4 material is safe than Li. 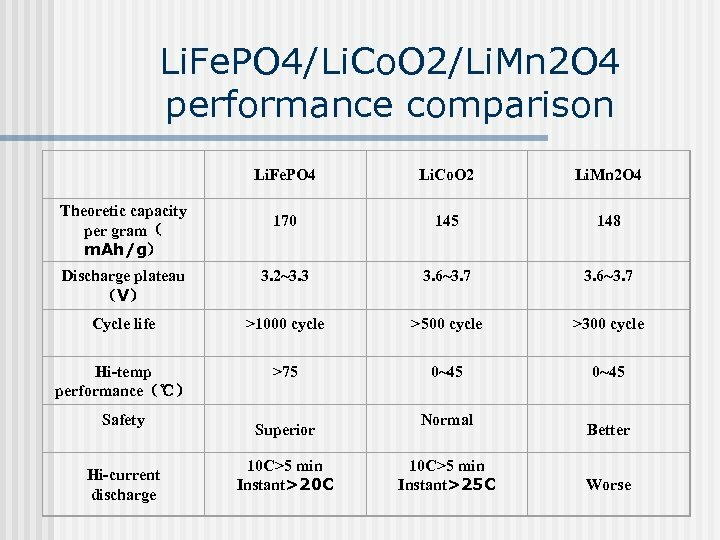 Co. O 2 & Li. 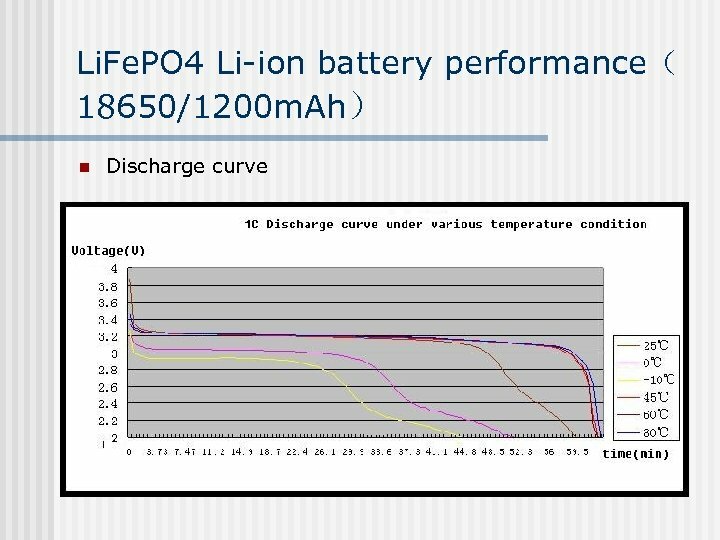 Mn 2 O 4 for it’s stable structure can be kept very well under continuous charging & discharging situations. 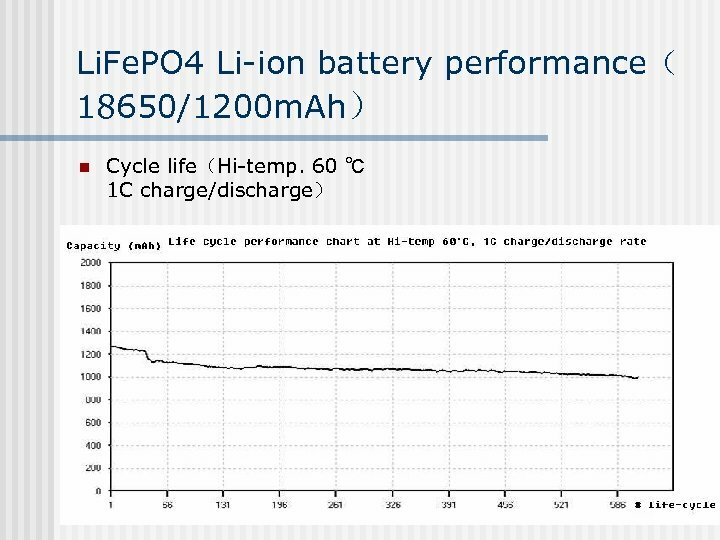 The superior high temperature & storage performance make Li. Fe. 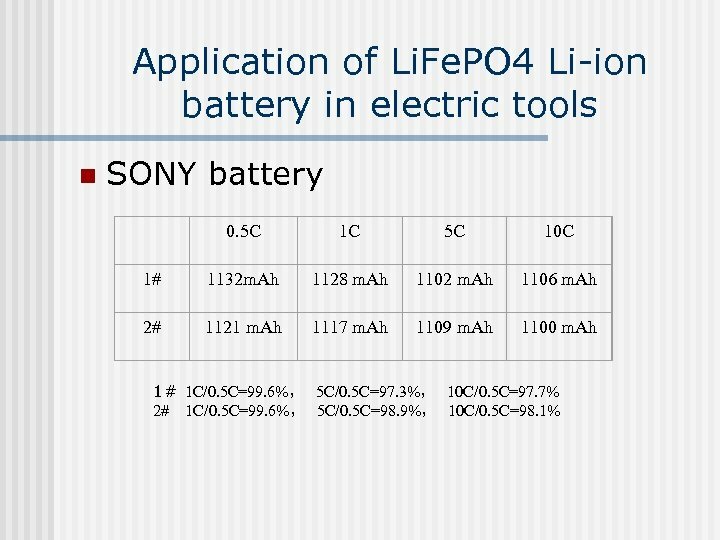 PO 4 the most suitable one for Li-ion battery positive material. 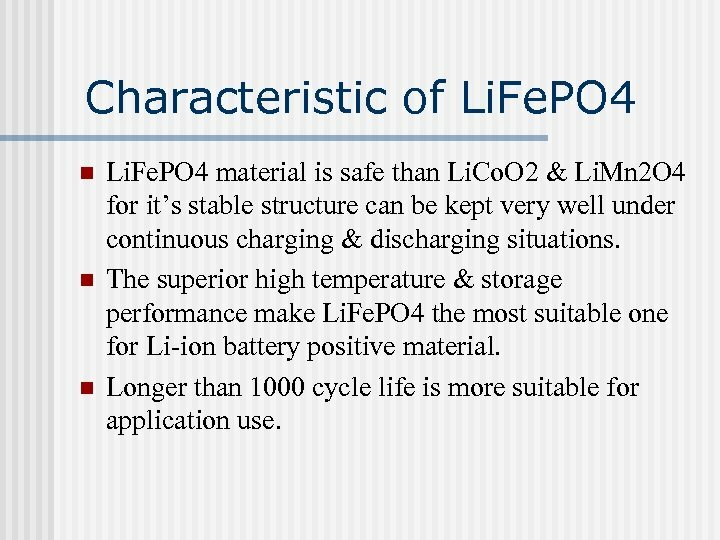 Longer than 1000 cycle life is more suitable for application use. 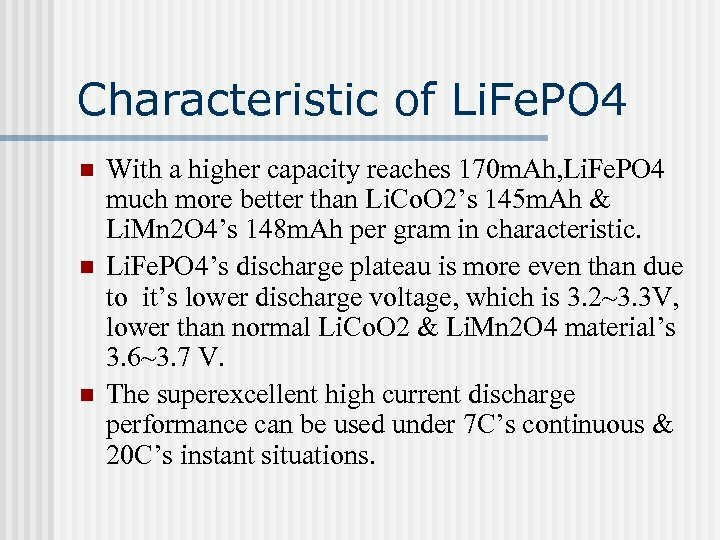 Characteristic of Li. Fe. PO 4 n n n With a higher capacity reaches 170 m. Ah, Li. Fe. 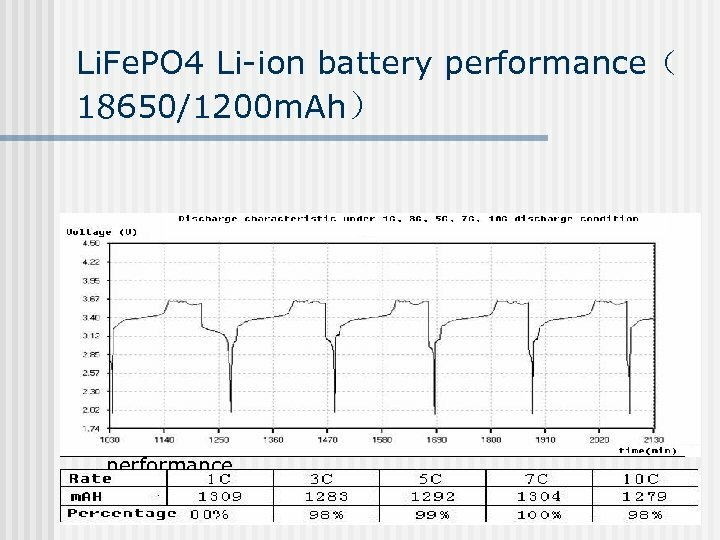 PO 4 much more better than Li. Co. O 2’s 145 m. Ah & Li. 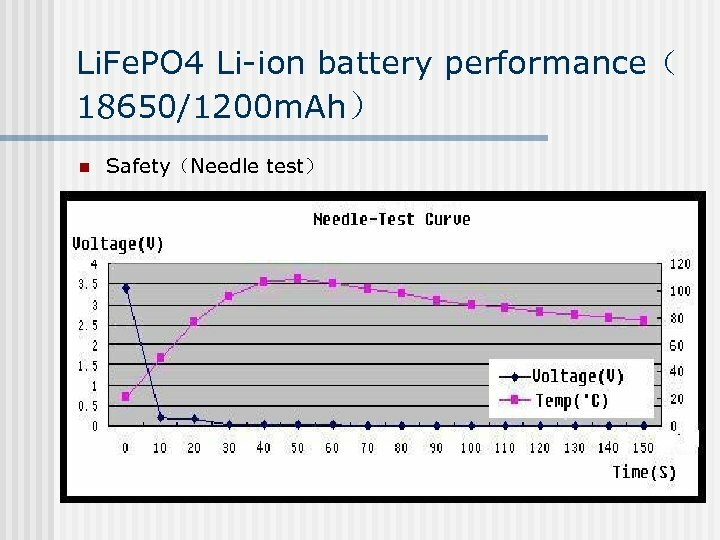 Mn 2 O 4’s 148 m. Ah per gram in characteristic. Li. Fe. 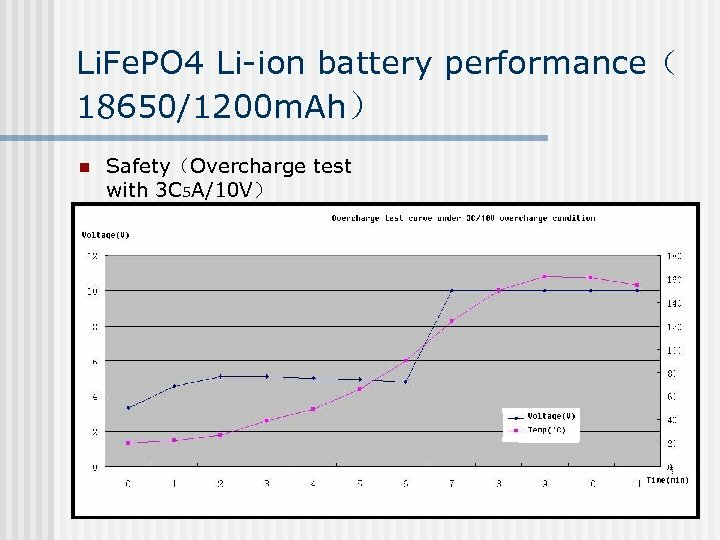 PO 4’s discharge plateau is more even than due to it’s lower discharge voltage, which is 3. 2~3. 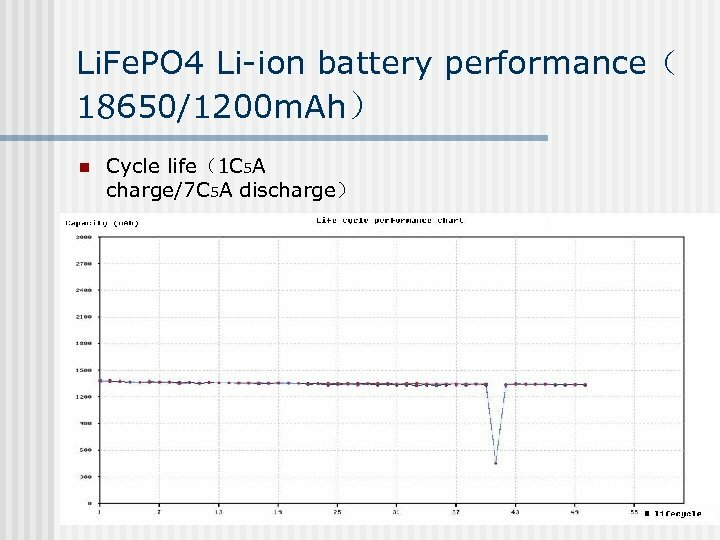 3 V, lower than normal Li. Co. O 2 & Li. Mn 2 O 4 material’s 3. 6~3. 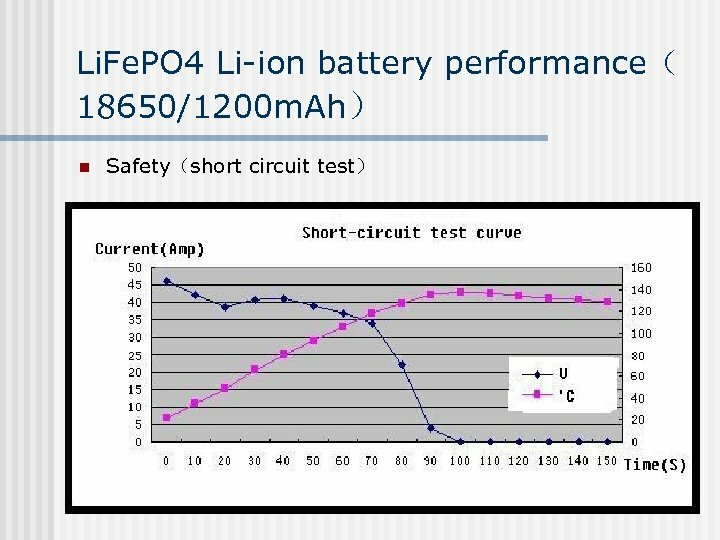 7 V. The superexcellent high current discharge performance can be used under 7 C’s continuous & 20 C’s instant situations. 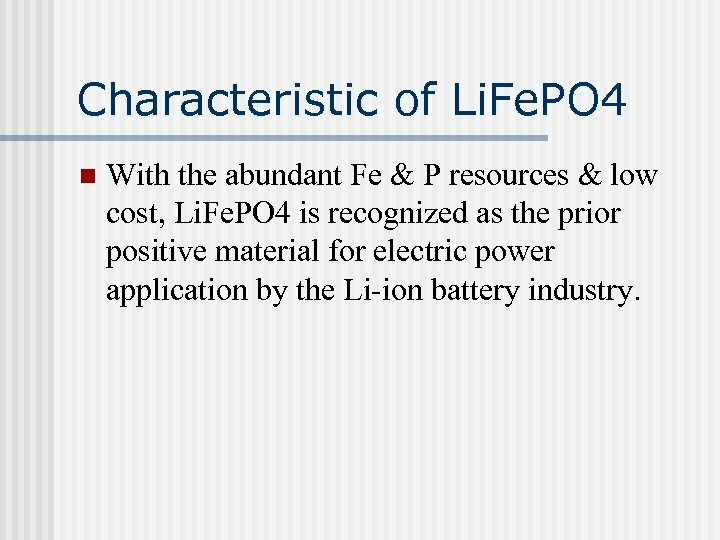 Characteristic of Li. Fe. 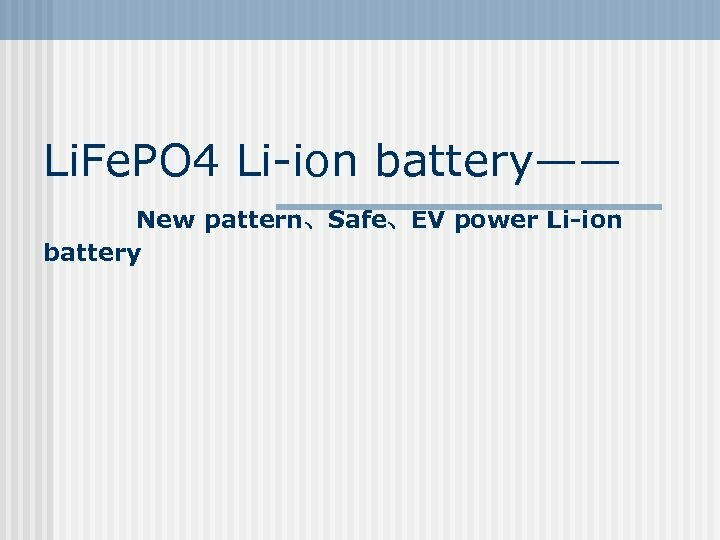 PO 4 n With the abundant Fe & P resources & low cost, Li. Fe. 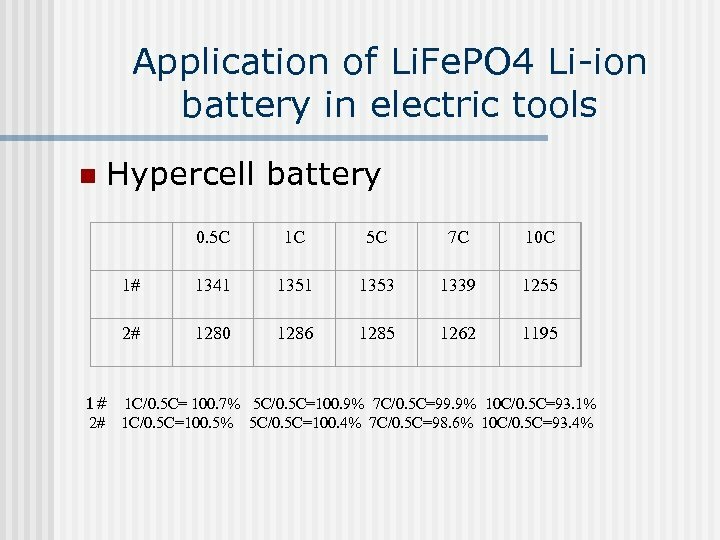 PO 4 is recognized as the prior positive material for electric power application by the Li-ion battery industry. Li. Fe. 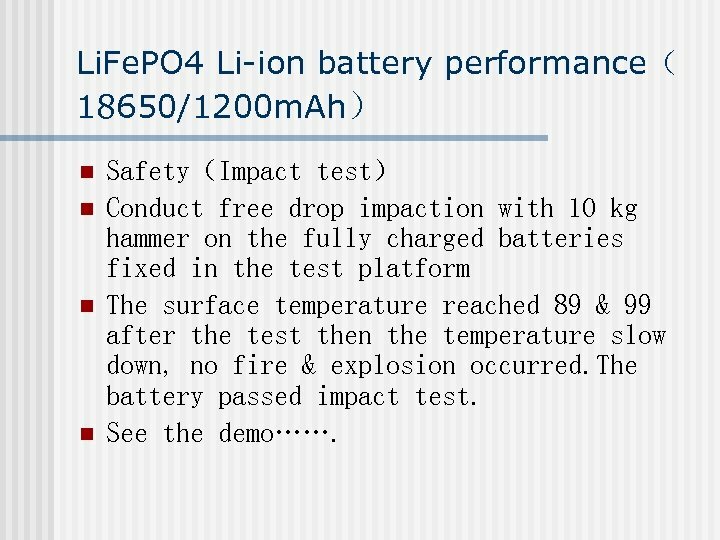 PO 4 Li-ion battery performance（ 18650/1200 m. Ah） n n Safety（Impact test） Conduct free drop impaction with 10 kg hammer on the fully charged batteries fixed in the test platform The surface temperature reached 89 & 99 after the test then the temperature slow down, no fire & explosion occurred. 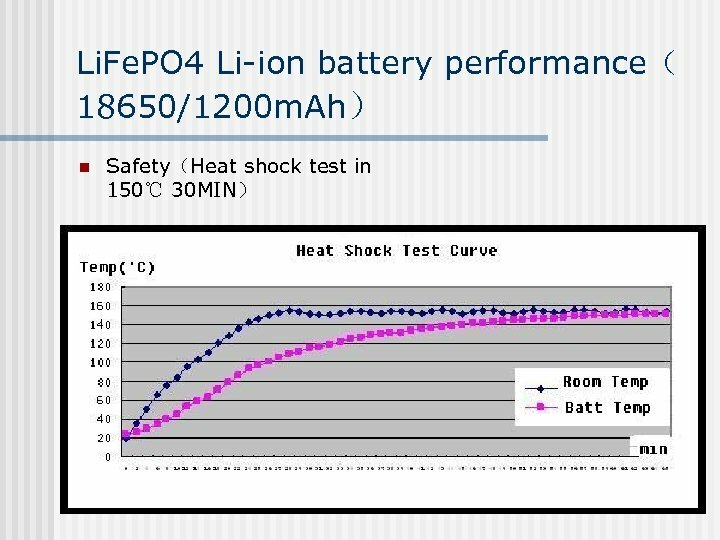 The battery passed impact test. See the demo……. 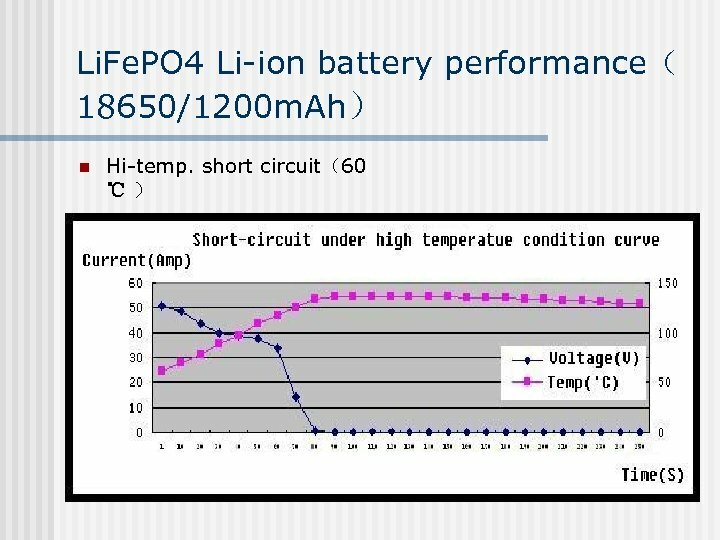 Application of Li. Fe. 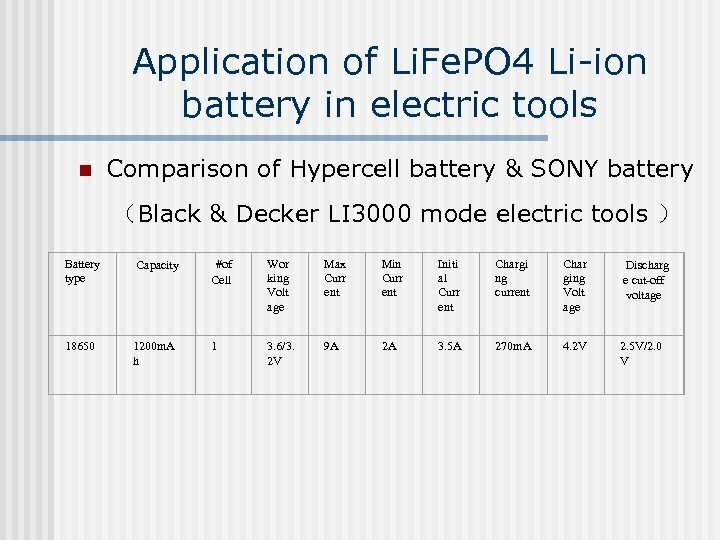 PO 4 Li-ion battery in electric tools n n Except for the discharge performance in 10 C 5 A status is a little lower than SONY product, Hypercell battery’s capacity is about 10 percent higher than SONY product. 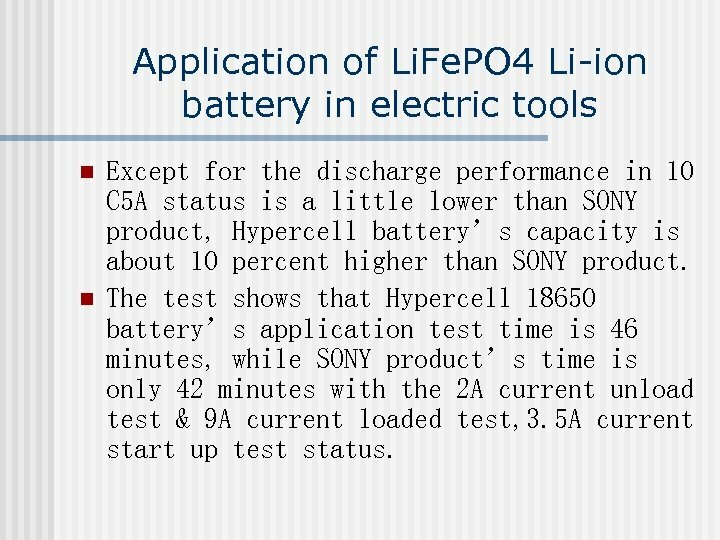 The test shows that Hypercell 18650 battery’s application test time is 46 minutes, while SONY product’s time is only 42 minutes with the 2 A current unload test & 9 A current loaded test, 3. 5 A current start up test status. 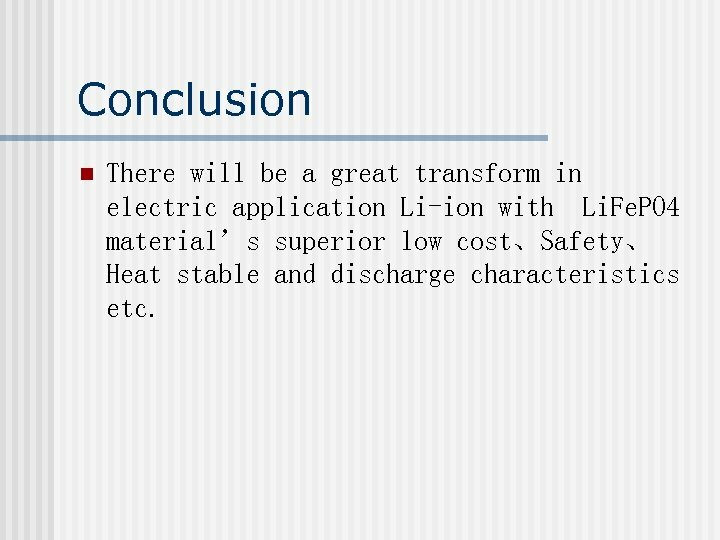 Conclusion n There will be a great transform in electric application Li-ion with Li. Fe. 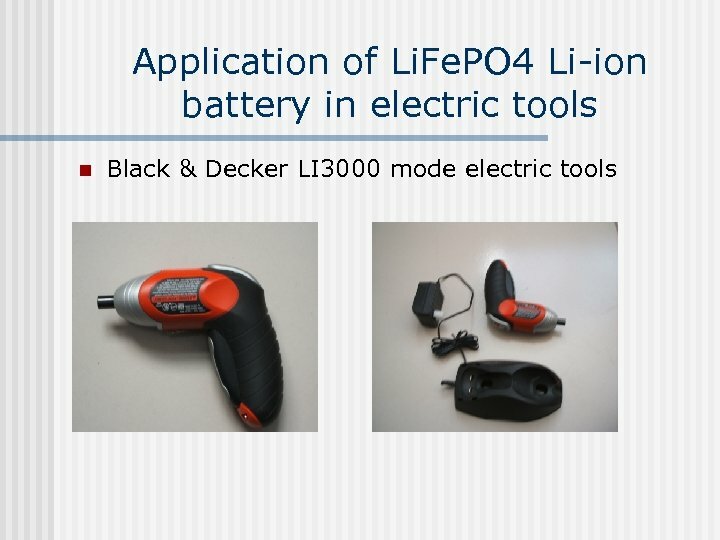 PO 4 material’s superior low cost、Safety、 Heat stable and discharge characteristics etc.